I'm a huge fan of Harry Potter series. I read all the books and watched the movies, twice for Deathly Hallows Part 2. I remembered crying at the end of the last book and the last movie. It was so hard to say goodbye to the best series ever. I still am a fan and I don't think I would ever get over Harry Potter. This is why I was so excited when I first heard that Fantastic Beast and Where to Find Them movie was coming on cinema. I rushed to the bookstore, confirming the book was coming along but I was disappointed to find out that the book wasn't a novel, it's a screenplay instead. But I'll buy it nonetheless because I'm fanatic liddat. A few days back I finally had the chance to have a date with Newt Scamander (the hero). I went alone, judging from the photo above, as my friend couldn't make it and I can't wait for another week to watch the movie. Obviously can't go on weekdays sebab kerja. FBAWTFT is about Newt Scamander, a wizard from London, travels to release one of his beasts to its original home in Arizona. The fantastic beasts were kept in his suitcase, not our ordinary suitcase, of course. Inside of the suitcase was a zoo! When Newt reached New York however, he accidentally switched his suitcase with a No-Maj's (what they call the American non-wizard, muggle for British), named Jacob Kowalski. The incident made few of Newt's beasts fled to the outside world and accused for the cause of a murdered No-Maj.
FBAWTFT show you the journey of Newt finding his escaped beasts, with the help of Jacob. Of course, it wasn't all as there's also the antagonist characters, and the dark force that was the main reason of the chaos in America, threatening to expose the wizarding community to the world. They portray the characters so well that I immediately fell in love at the first sight of Newt Scamander. Since FBAWTFT is from the same magical world as HP so I couldn't help but to compare the two main characters. Newt is definitely my bias because he's so cool, having an easy going character. For a fantasy movie, you can't ignore the CGI, and I assure you wouldn't disappoint with FBAWTFT's. 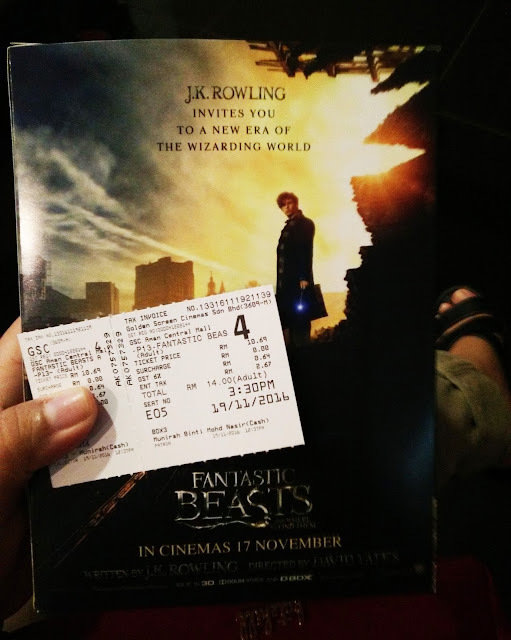 The setting, especially the fantastic beasts were so awesome they looked so real, and beautiful especially yang rupa macam ular plus naga, can't remember its name. For overall, I give this movie 9/10 rating. If you're a fantasy movie lover, FBAWTFT should be in your must-watch movie list. Whoah. This must be a good movie then!